St. Paul, MN:	1,000 march on May 1st for immigrant rights | Fight Back! St. Paul, MN - 1000 people marched to the Minnesota State Capitol on May 1, International Workers Day, in support of immigrant and workers’ rights. 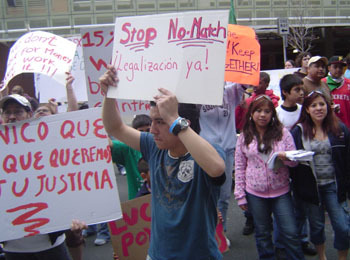 Marchers demanded a stop to the immigration raids and deportations that target immigrant workers and families. They also called for legalization for all undocumented workers. The rally started in a park overlooking the Mississippi River, marched through downtown Saint Paul and ended at the State Capitol. One of the recently-fired workers from D’Amicos restaurant spoke at the rally about their struggle. In early April, D’Amicos fired 15 long-term Latino immigrant workers, accusing them of ‘social security no-match’ violations. The workers have waged a protest campaign and have galvanized broad local support. A student from Roosevelt High School in Minneapolis whose father was deported last year also spoke at the rally. Students walked out from some area high schools to attend the rally. A group of immigrant workers from greater Minnesota also came by bus. Along the march route, stops were made in front of the Saint Paul Pioneer Press building and the Minnesota Public Radio building, while delegations of marchers went inside to demand that the media outlets stop using the term “illegal” to refer to undocumented immigrants. 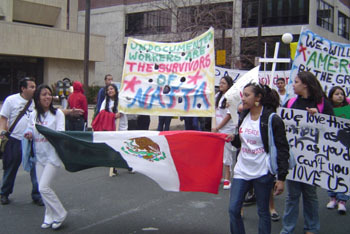 The march also stopped in front of the National Guard building to make the connection between wars that the U.S. government wages abroad and the immigrants that come here fleeing U.S. wars and economic policies. 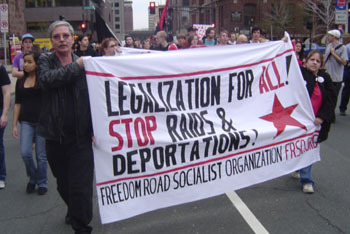 The Saint Paul march was organized by the May 1st Coalition, which includes the Minnesota Immigrant Rights Action Coalition (MIRAc), Asamblea para los Derechos Civiles, Minnesota Immigrant Freedom Network, and many other groups.